Is it worth taking Asus' latest sports model for a spin? The word Lamborghini infers speed, power, good looks and kudos. 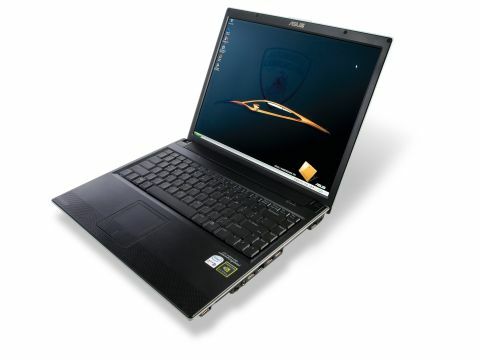 So, we're duty bound to expect the same from this Lamborghini-branded Asus VX-1 notebook. Sadly, this laptop suffers many of same unfortunate inadequacies as the brand itself: it favours brazen extravagance over practicality and design perfection. The problem certainly isn't in the looks department. The VX-1 is sturdy and attractive. The understated Lambo logo sits atop the lid which, like the main chassis, is slim and toned. The VX-1's build quality is excellent too; it feels compact when you carry it, and the stiffness of the screen gives it a robust feel when the machine's in use. Once you've started it up, the screen immediately disappoints. A wide-aspect design been shelved in favour of 4:3, and the viewing angle is pretty woeful. The 1,400 x 1,050 resolution goes some way to make up for this, but while the brightness levels are excellent, the contrast is poor. The screen isn't built for gaming, and even movie playback suffered from a little ghosting. The VX-1 is well connected, as WLAN 802.11 a/b/g is present, as well as Bluetooth, two audio jacks and a 56K modem. The four USB ports are ample, but are all positioned on the right - which clutters your desktop considerably. On the opposite side sits an adequate dual-layer DVD burner and a media card reader - albeit one that only reads SD, MMC and MemoryStick. The power under the hood is where the Lamborghini excels, though. The pairing of a dual-core T2500 with 2GB of RAM made the VX1 fly through benchmarking, as did the 120GB hard disk. Unfortunately, all this muscle is matched by a relatively meek GeForce 7400VX that really struggled in 3D Mark and Doom 3. Factor in the panel, and you've a machine that struggles with gaming. The VX-1 is certainly a smart notebook, it suffers from its supercar branding. It delivers in terms of looks, build and power, but though the VX1 is competent, it doesn't represent good value for money - you can pay nearly £1.000 less for a similar-spec machine from a host of alternative manufacturers.